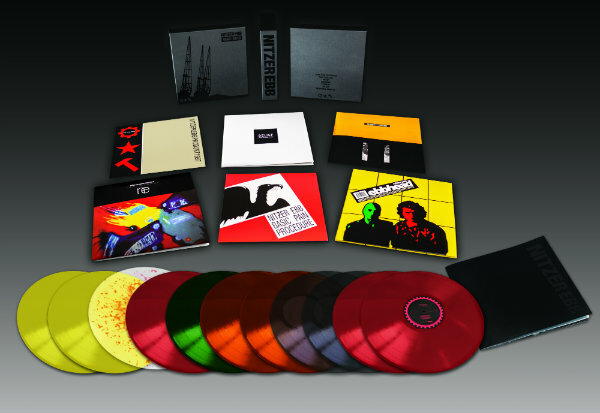 EBM giants Nitzer Ebb, last active with the release of 2010’s Industrial Complex and subsequent touring, today announced a giant career-spanning vinyl box set and plans to tour in 2019 with original drummer David Gooday back on board for the first time since 1987. As The Quietus reports, the group has launched a new website dubbed TEXTPRODUKT as its new official information source. 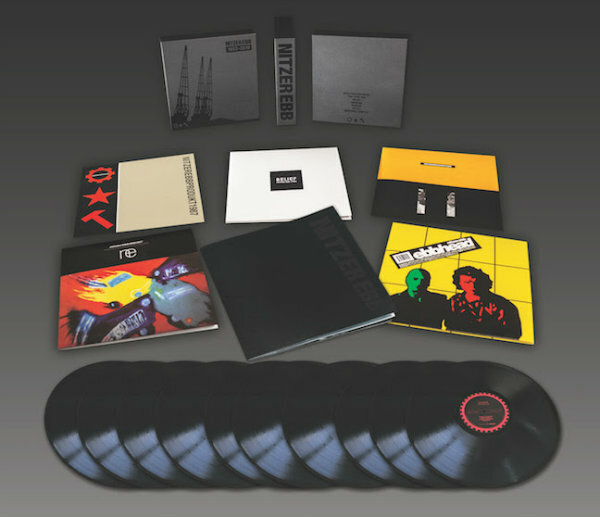 The site both announces the new box set — titled 1982-2010: The Box Set — as well as the fact that “Nitzer Ebb will resume live performances in 2019.” So far, just one date has been announced: the Amphi Festival in Cologne, Germany, on July 20, 2019. 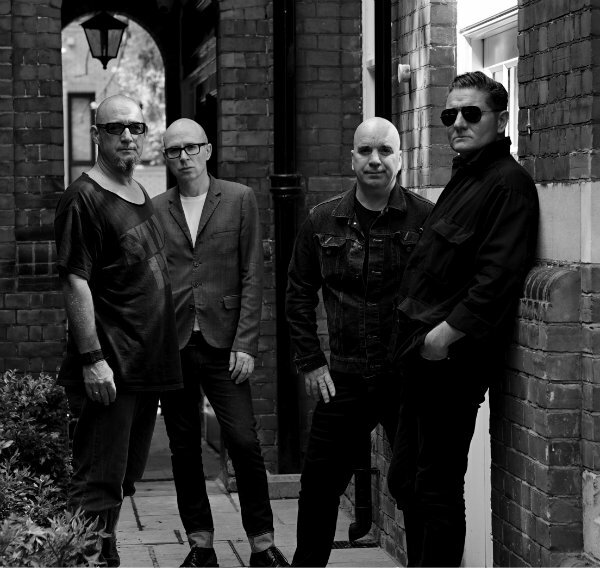 The current Nitzer Ebb lineup, the site reports, will include original founding members Bon Harris, Douglas McCarthy and Gooday, plus Simon Granger of the group Stark. As for the box set, it is due out Oct. 5 in an 11LP colored vinyl edition and a 10LP black vinyl edition, and includes reissues, on double vinyl, of each of the group’s five albums for Geffen/Mute, with bonus material appended. The colored-vinyl edition, limited to just 500 copies worldwide, also includes a repressing of the band’s self-released debut Basic Pain Procedure. This career spanning retrospective box marks the first time that all five of the band’s albums for Geffen/Mute have been collected in one complete box set. The box set features expanded double colored vinyl, of each album, with several bonus tracks and rare 12” mixes, all carefully curated by Pylon Records and the original artwork expanded into gatefold sleeves, with embossing and spot UV finish. It also contains a large size 28-page booklet with liner notes by Douglas McCarthy and Bon Harris and unseen photos, flyers and artwork, detailing their entire career in chronological order from Essex to Los Angeles. These albums have been out of print since the early 90s and have never been reissued. The actual two-piece box is made of hard board stock, wrapped with leather paper and the UV design is hot foiled stamped. The box also has accommodated their first self released album from 1983 and their last release from 2010, by leaving adequate space inside, to complete the collection by the fans, as these titles have been in print in recent years. There will be a limited colored vinyl edition of the box, which will include a repress of the bands self released album, Basic Pain Procedure, available only from the Pylon Records website for a short period of time. The Industrial Complex vinyl has been in print in the last several years on colored vinyl, and easily attainable on many online and fine record stores around the world. The box sets, which range in price from $189.99 to $209.99, can be pre-ordered from Pylon Records. Best news ever! Now, let’s hope they release a version of Basic Pain Procedure that doesn’t have that high-pitched background noise. Still looking for decent sounding remaster. There are no plans for the records to be available individually. The 500 colored vinyl version is limited to the box set and only available through the website, once sold out it will be deleted. There is another 500 box sets that is available on black vinyl for distributors, stores, Amazon etc. The focus for the near future, is the band reforming, tour dates and the box set. Also be advised that the 29 bonus tracks are not available on iTunes, and the album That Total Age is not available in North America on iTunes. There are no plans to do CDs at the moment, but since this is going to be long tour etc, just like the Depeche Mode tour, then that might change, if is does it will not be a box set CD, just individual Cd releases. Basic Pain Procedure Vinyl is take from the Original studio master cassette, so there is no background noise. The Cd that was released some years ago did way the studio master and a live recording with lot of background noise. I hope this helps any questions you might have at this moment. Please consider 2-CD releases with additional bonus tracks. We already have 2 Cd releases done just waiting for the US Tour dates. Everything is tied into the band announcing more tour dates and sorting out the details. WOW! Very interested in the CDs, even if they need to be procured individually. To have some of these classics remastered on CD is GREAT NEWS! Thank you Pylon Records! Great news re the CD releases. I just saw them pop up on Discogs today.